In the autumn of 1977, shortly after I met him, Eugene was called to play the part of an old Lakota shaman in an episode of the popular Grizzly Adams TV show, appropriately titled, “A Bear’s Life,” filmed in the Uinta National Forest in Utah. 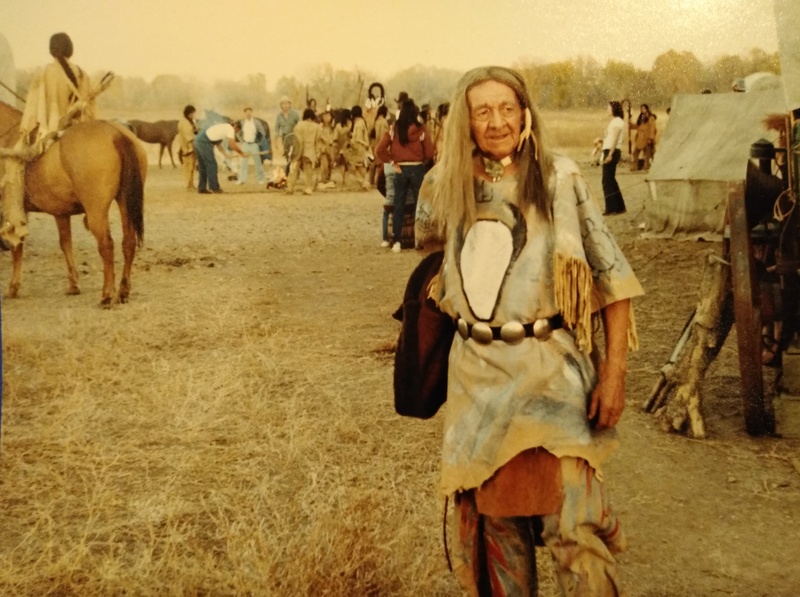 Eugene Standingbear between scenes of “The Chisholm”s miniseries. Again, he said, the Indian costumes weren’t portrayed accurately, but he thoroughly enjoyed getting to know the cast and crew. Eugene poses outside Bent’s Old Fort for a snapshot as the crew prepares the campfires for his first scene, which will be filmed after dark. 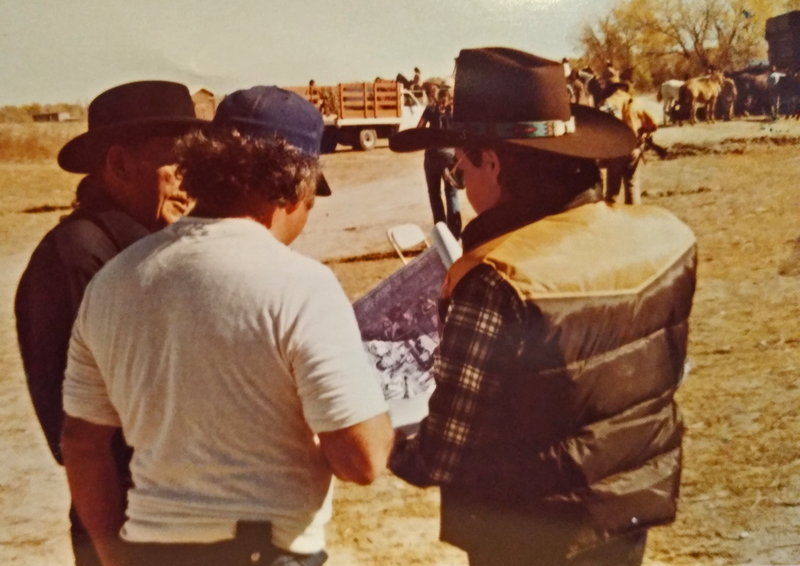 Eugene Standingbear goes over his healing ceremony with the head prop man (center) and Native American technical director George American Horse (right), studying a sketch of an authentic healing ceremony drawn by Eugene from memory and research. Most Native American tribes today, including the Lakotas, try to preserve the old ways in their Pow Wow celebrations, which are usually open to the public and aim to foster honesty, honor, respect, tradition, and generosity… noble values that held together the ancestral tribes before the coming of the Europeans. It’s as though noble values of this kind had been woven into the genetic fabric of the Native American people across the millennia of tribal living. America in 2018, with lying and corruption boiling over from government and spreading through society, could certainly learn a lesson or two about the cohesive force of the old, noble values of the Native Americans. It wasn’t unusual to see Eugene leaving town in the summers in the mid-70s in his full-size, luxury low-rider on his way to a Pow Wow celebration. He said getting back to his people always recharged his spirit. The Pony Express. Eugene’s introduction to Hollywood happened a half-century earlier, in 1925. Every summer a group of Lakotas left the Pine Ridge reservation to entertain at the Cheyenne Frontier Days celebration in Wyoming. Word spread quickly that year that a Hollywood crew would be filming a western in Cheyenne and would need Indian extras. It stirred a lot of excitement. On the morning of the big day, the streets outside the agency were packed with young men and women hoping to get a seat on the first fleet of trucks parked in a line, waiting to roll to Cheyenne… but not everyone would be chosen. A film crew representative had flown in from Hollywood and stood by the boarding area to screen the Indians. In order to go to Cheyenne with the first fleet they had to “look Indian.” As the crowd milled forward, the film rep glanced up and down at everyone, assessed all the costumes, and waved them through one by one if they were wearing feathers, buckskin, and beads. A young mix-blood, Johnny Gresh, who farmed wheat on the north end of the reservation, didn’t even own any Indian clothes. So he bought a beaded buckskin vest from another young man, rushed into the agency, stripped down, and pulled the vest on like a pair of shorts, tying the rawhide straps in the front. He tied a turkey feather to the back of his head and hurried back to the line. The film rep waved him through. Several hundred men and women loaded trunks, musical equipment, teepee poles, and rawhide teepee walls onto the trucks, climbed aboard, and off they went to Cheyenne. The film rep walked him to location—the prop of a frontier town that had been erected just over the hill from the Lakota camp. As they approached the town of two-dimensional buildings, the rep filled Eugene in about the movie and his part in one of the closing scenes. The movie was Pony Express, with Wallace Beery, directed by James Cruze. As part of the plot, a Lakota band had abducted a young, Shirley-Temple-ish girl, and Wallace Beery loved the cute little thing like a daughter, so he was fighting mad… killing Indians left and right… anyone he could get hold of. Eugene would fight with Wallace Beery at the end of the movie. He stripped down to breech cloth and moccasins and put on a wig with long, black braids. The assistant director told Eugene he’d be carrying a tomahawk and torch and would try to set Beery’s blacksmith shop on fire. Eugene would enter through the alleyway from the rear of the building prop while Beery would emerge from the front door, come around the corner of his shop, and catch Eugene red-handed. Running through rehearsal, they met near the alley. Beery grabbed Eugene loosely by the throat while a camera stood nearby for a close-up shot. “Indian, where is that girl? !” Beery shouted while choking Eugene lightly, bending him backward over a hitching rail for about 30 seconds, then throwing him down on a mattress the crew had buried a few inches under the dirt to break the fall. Eugene croaked, “Mr Beery, Mr Beery, you’re choking me.” Oblivious, Beery threw Eugene down at the mattress as hard as he could. Eugene’s head hit the ground behind the mattress and he saw stars. Later in the day an attack scene was scheduled in which Indian warriors would storm into town on horseback. There was a problem; the head chief (played by Duke Kahanamoku, a gold-medal Olympic swimmer from Hawaii) had never been on a horse in his life, so Gene was asked to be his double and lead the war party on the attack. He would wear double-trail war bonnet and ride the best horse of the lot, a graceful spotted horse owned by a local rodeo star. The other warriors crowded around the wrangler’s corral and took turns roping a horse for the scene. By the end, all the good horses were taken. During the rehearsal, Eugene’s horse stepped on a sharp rock, limped into town, and was out of commission, so Eugene was assigned a thin, mangy pony that was almost too lazy to trot out to join the other mounted warriors, who were all lined up just over the hill for the next take. Cameras were lined up on high scaffolds along the street, and a siren sat ready to start the attack scene. But the assistant director wasn’t quite ready. There’d been too many mistakes during the rehearsal. Eugene’s pony loped clumsily back to the director’s seat. 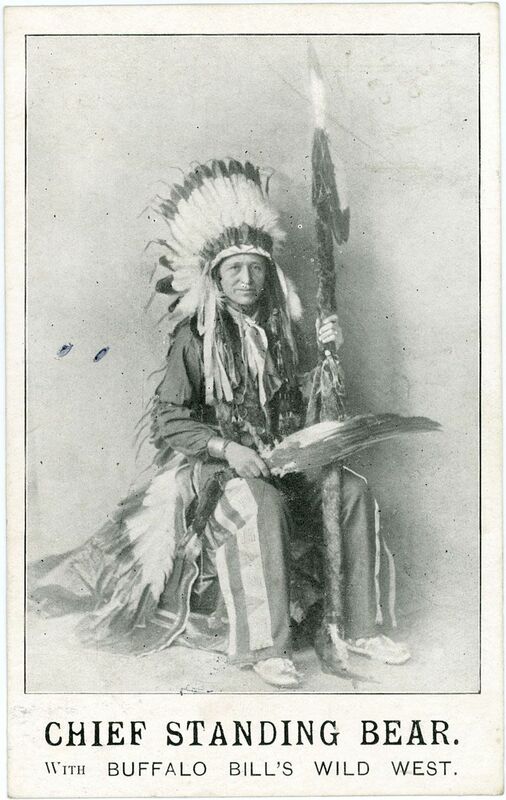 Eugene returned to his war party and relayed the instructions in Lakota. He’d get a few extra dollars at the pay window for translating. Suddenly the siren blared and the townspeople began firing blank cartridges at the Indians. His startled pony took off at a frenzied gallop. Eugene came storming into town with a hundred warriors and a cloud of dust, his terrified pony galloping at full speed when it stepped in a chuckhole, stumbled, fell end over end, and sent Eugene sliding across the ground. The assistant director had instructed everyone to use these mistakes wisely, lying motionless as though they’d been shot off their horse. So with a hundred angry warriors bearing down, Eugene covered his head with his arms as the thundering horses brushed him and kicked him and rolled him over and over in the dirt. Luther Standing Bear. In the 1930s Eugene was living in Pawhuska, Oklahoma, married to Mary Lookout, daughter of Fred Lookout, Principal Chief of the Osage tribe. The Osage were the richest-per-capita people in the world at the time because of oil discovered on their land in 1897. Mary’s dad Fred Lookout and Eugene’s dad Luther Standing Bear became friends as teenagers, after they were both enrolled at Carlisle Indian School in 1876. Together they grew into young men determined to someday help their people, the Osage and the Lakotas, to find their way in the new America. That early bond between Fred and Luther led to the eventual marriage of their children, Mary and Eugene, 50 years later. Now, Eugene was travelling around the country in limousines with his Osage family and friends, playing golf, and enjoying a life of leisure, while his dad Luther Standing Bear was living in Huntington Park just a few miles from Hollywood, presiding over the American Indian Progressive Association, writing books and lecturing on the need to keep Native American heritage alive, and working as technical advisor for Indian movie sets in Hollywood. Eugene hadn’t seen his father in two decades, so he decided to catch a train to California. Before the trip he learned that a new golf course had just opened in Phoenix, so he stopped there on the way to Hollywood. The new owner thought it would be good publicity for his new course if he played an exhibition match with the young Lakota warrior who had earned a reputation in Oklahoma. He asked Eugene if he had some sort of authentic-looking Indian picture of himself for the newspapers, but the only picture he had was of his father wearing a double-trail war bonnet, which Mary had packed in his suitcase to help break the ice when he met his dad later in the week. The golf course owner loved the picture, so the local paper came out that evening with a special feature about tomorrow’s exhibition match between Lakota golf champ Standing Bear and the golf pro who owned the course. The article was accompanied by the picture of Luther Standing Bear. Eugene spent a week with his dad, touring southern California in his brand-new Buick, meeting his friends, playing billiards, shooting bow and arrow, and talking about their lives. Eugene was especially impressed by his father’s skill with bow and arrow. He told Eugene that one of his pastimes was competing (and always winning) against the Japanese professional archers who toured occasionally through southern California. William S Hart mansion, now a museum. Eugene met his dad’s friend, William S. Hart, a retired actor in silent westerns. Raised in part in Lakota country, Hart had spent his life lulled by the aura of the Old West. 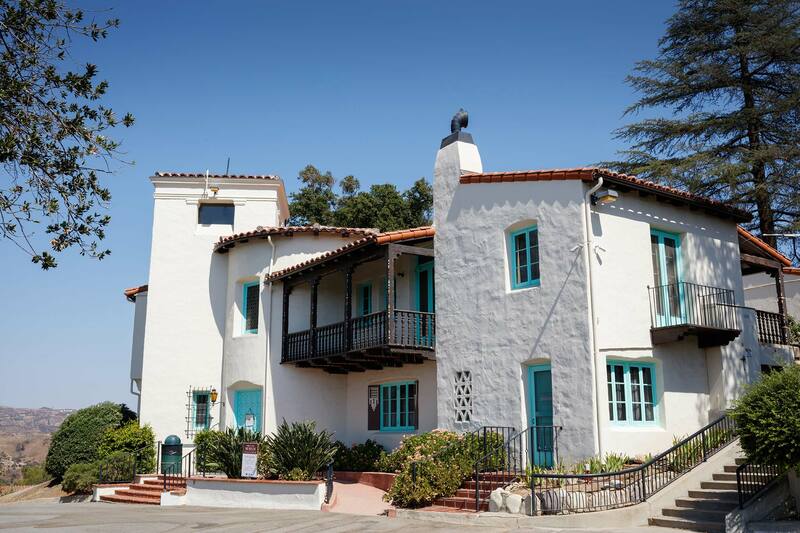 His large estate in the Santa Clarita Valley was topped off with a ranch-style mansion. A large herd of spotted horses grazed in the pasture. Hart said he was especially drawn to the Plains Indian life style. He employed a dozen Native American ranch hands to do chores around the estate. The walls in the ranch house were decorated with Native American artwork, and all the beds were covered with authentic broadcloth with designs down the center. Two gun cases sat in the living room, one for rifles, one for pistols. Another room had been modeled into a small movie theater with projector, screen, and comfortable, padded chairs. Wings extending from either side of the plush house had been fashioned into luxury apartments for his overnight guests. Since his retirement Hart hosted a stage show featuring authentic Native Americans singers and dancers, and he invited Luther and Eugene to appear in one of the shows. Luther happily accepted. He’d signed a contract with his people on the Pine Ridge reservation to produce tons of authentic, traditional dress clothes that he marketed in California, especially to the film industry. So for the performance in Hart’s stage show, Luther and Eugene would have access to some of the finest Lakota dress clothes ever made. They’d both grown up to the beat of the Lakota ceremony drum. Eugene was considered one of the best dancers at Pine Ridge. His father was teaching Lakota dance to professional dancers in Hollywood. The following evening, Luther beat a huge, wooden floor drum while his son performed a slow war dance, a chief’s dance, and a fast dance before a packed audience. Iron Eyes Cody. There were lots of Indian extras working in the film industry, and none found as many parts as Iron Eyes Cody. He had a white man’s sharp business mind, he knew many producers and directors, and he made it a point to keep abreast of the filming schedules of all the studios several months in advance. He had a cottage on Gower Street that had become a home base for Indian extras subsisting on bit parts in western films. Cody helped them find jobs and taught them the ins and outs of Hollywood. Their steadiest employers were low-budget studios like Trem Carr that pumped out miles and miles of spliced-together, dubbed-in, shoot-em-up western movie film. Luther Standing Bear was a friend of Iron Eyes Cody, whom he introduced to Eugene that week. In fact, several years earlier Luther had given the Indian-sounding name “Iron Eyes Cody” to the man, whose real name was Espera (Oscar) DeCorti, born in Louisiana in 1904 to two Sicilian-Italian immigrants. Eugene walked quickly to the studio and was escorted to the viewing room, where he was shown three silent Indian scenes, then he dubbed in the actors’ voices with his own. The first scene showed a night setting and teepee, its walls shadowed by the silhouettes of a tribal council inside. It appeared to Eugene to be an Osage religious ceremony. The technicians gave him an Osage peyote drum, and he dubbed the scene with a peyote song he’d learned from his friends in Oklahoma. 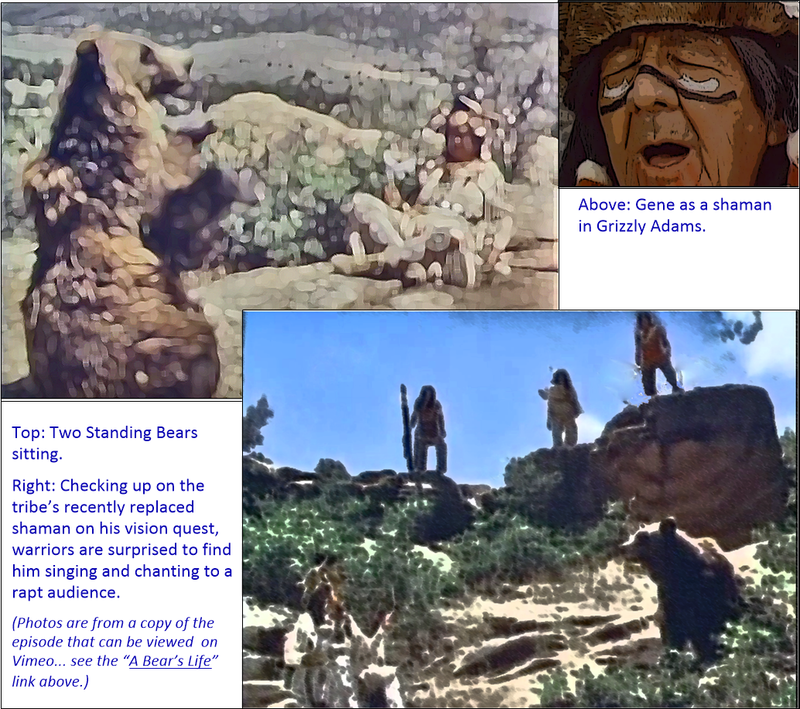 The next scene showed an old Lakota chief using Plains Indian sign language while his lips moved silently on the screen. Eugene had learned sign language as a child from his Uncle White Bull, so he simply translated the old chief’s signings into Lakota. When the final scene flashed on the screen, Eugene was pleasantly surprised to see his friend Iron Eyes Cody on horseback wearing a war bonnet, playing a Lakota chief in war council with another Lakota chief, for a movie that was currently under production. Gene translated Cody’s spoken English to Lakota for the dubbing. The cook was amused that Eugene had dubbed a Lakota voice for Iron Eyes, who didn’t like Indian talk. Whenever his housemates spoke Lakota in his presence, Iron Eyes would growl, “Dammit, you guys, talk English so people can understand you.” The cook suggested that Eugene keep today’s work a secret, as it could stir up hard feelings among some of the more serious veterans in the house to know that a newcomer had earned 50 dollars so easily. Before long, though, the secret leaked out and caused a big problem, not for Eugene as much as for the cook himself. The studio gave Iron Eyes a handful of tickets to the premiere a week or so after the film was completed, so he invited his housemates to accompany him and a group of his white friends to watch him on the screen opening night. Eugene took it in stride. He knew the voice was his, and he’d gotten paid for it. That’s all that mattered. If the white folks wanted to believe it was Iron Eyes talking, so what? After all, Iron Eyes was doing so much good for so many Indian extras, no sense rocking the boat. Eugene glanced over at the cook, though, and knew trouble was brewing. He’d gotten to know the old man, and from the squirming and frowning he was obviously irritated by the snub. To Eugene’s relief, the cook was able to keep it inside throughout the movie. Joe accused him of lying, and fists started flying… just like in the movies. Next the actors went to the wrangler’s corral to rope their horses. The small ponies were always roped first, since the director would frequently call for some of the riders to fall to the ground. With small ponies they didn’t have so far to fall. Being shot off a horse was worth an extra 10 dollars at the pay window… as long as the fall was part of the script. An accidental fall wasn’t paid, even if it was included in the movie. Once every Indian had a horse, the director barked, “Renegades!” The actors put on buckskin leggings, big renegade hats, and breech cloths, mounted up, and stormed past the camera chasing a stage coach or supply train. The actors changed into Indian war costumes and made another full-speed pass. The actors replaced the Indian clothes with blue army outfits to storm past the camera for a final sequence. A week or two later, during the premiere, a series of war victory whoops filled the theater from the front row as the Indian extras watched themselves flash across the screen three times: a dozen renegades being chased by a dozen Indians, in turn being chased by a dozen mounted soldiers swinging sabers, firing army pistols, blowing bugles, and waving flags. Indians die laughing. Thousands of Indians were being massacred every year on movie screens at the time, and the Indian extras frequently joked about it. Directors were often frustrated when their cameras panned Indian bodies strewn about after a massacre scene, and many of the “dead” had broad grins across their faces. Bob Steele. During his stint in Hollywood Eugene befriended Jim Thorpe, the famous Native American athlete, actor, and humanitarian. Though Thorpe has credits in a lot of movies in the 1930s and 40s, Eugene said he also took anonymous parts as an Indian extra occasionally, where the two became friends. 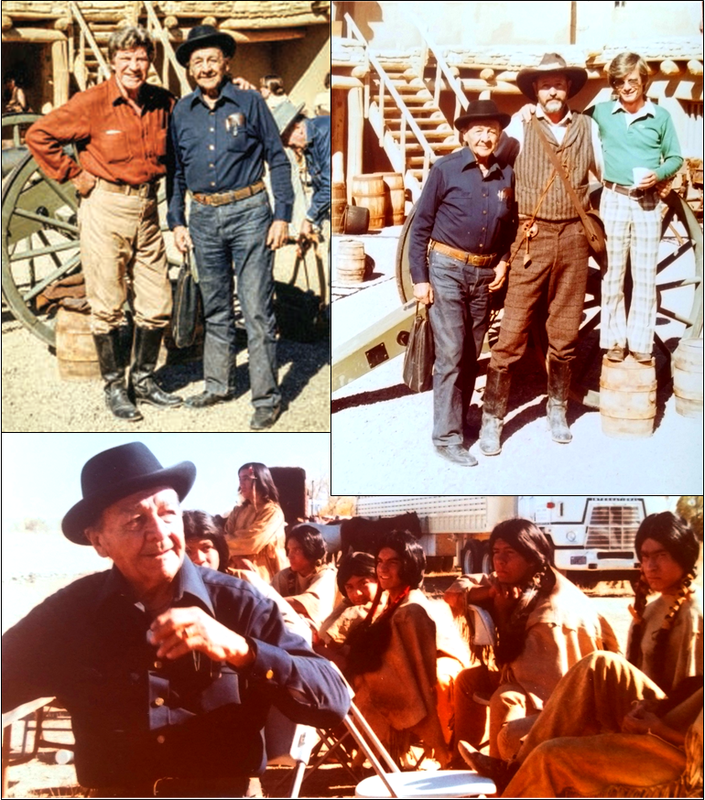 In one movie they crossed paths with Bob Steele (today ranked #151 among popular western actors). In the script, the thin, 5’5 Steele was killing the savage Indians left and right… typical of movies of the era. In one scene, Steele was supposed to wipe out seven knife-wielding Indian extras in a single brawl. To have a little fun and amuse the crew, Thorpe and Standingbear called the other five warriors together for a brief powwow. When the director barked, “Action!” the seven Indians formed a circle around Bob Steele and moved in. Thorpe grabbed the little man around the knees and set him down gently on the ground as the other Indians grabbed and arm or a leg and started hacking and chopping the air around Steele’s body with their rubber knives and tomahawks. “Stop! Stop! Cut! Cut!” shrieked the director while the crew and spectators all cracked up. Everyone loved the scene except the director and Bob Steele. The director was fuming and cussing about wasted film, while Steele was still stretched out on the ground like a coyote, struggling to get free. After a few months in Southern California, it was time for Eugene to say farewell to his father and friends in Hollywood, and to return home to his family on the Osage reservation. This entry was posted in Uncategorized and tagged hollywood portrayal of native americans. Bookmark the permalink.